Due to the numerous requests over the years, I am making a kit available to build your own Fan Controller. 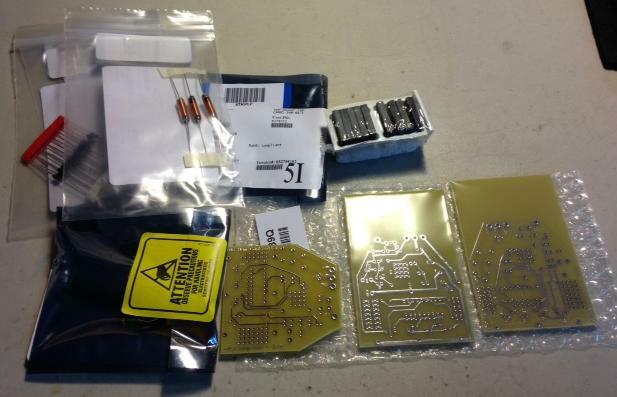 The kit includes all parts including the wall box, printed circuit board, electronic parts and the cover. The schematic below shows the updated schematic. 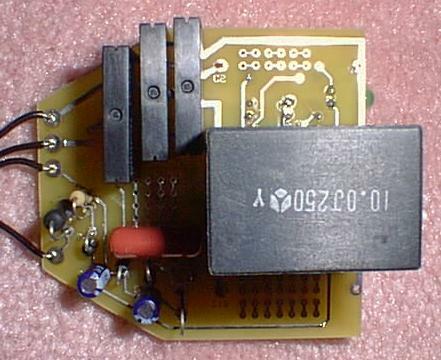 To make the design more compact so that it will fit on one printed circuit board, the power supply has been modified. 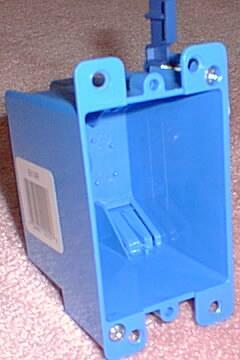 A capacitor-based supply will be used instead of the transformer. This is similar to all the millions of X-10 units that are currently in use. 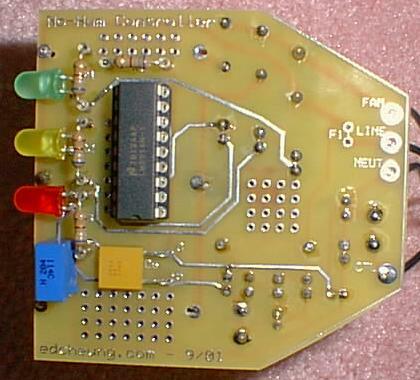 The schematic of the fan controller kit. Control comes from the output of a standard wall switch. Parts values may change, check parts list for updates. The Fan Controller allows the use of a cheaper standard wall switch to control the fan instead of the more expensive inductive wall switch (a savings of several tens of dollars). The modification that will be needed on the wall switch is described below. The 'output' of the wall switch is simply connected to the 'control' line above. Control is derived from the output of regular wall switch. 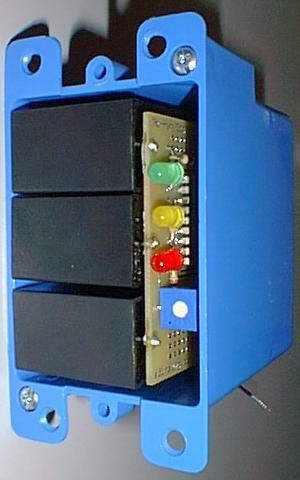 The signal is filtered to obtain the dimming level as a low level analog voltage by C3 and its associated components. The LM3914 chip selects one of its outputs depending on the amplitude of the voltage, which turns on one of the LEDs to indicate the speed, and turns on one of the Solid State Relays to control the fan speed. The LEDs allow a handy display of the speed. The top LED (green) shows full power to the fan. The middle LED (amber) connects two 10uF capacitor in series with the fan to slow it down to about half speed. Finally, the bottom LED (red) connects one 10uF capacitor in series to place the fan in a low speed mode. This latter speed is useful in high ceilings during the winter as it stirs the air without causing a draft. I have no doubt that this has lowered our heating bills in the winter. The potentiometer allows calibration of the system so that full speed is obtained with the wall switch fully ON. The kit is designed for a motor load of about 60 Watts, which is typical of almost all ceiling fans. If your fan has a different power consumption, max speed is not affected, but medium and low speeds may not be setup as intended. The Solid State Relays can handle loads up to 2 Amps (240 Watts). They are very small and of the 'zero-crossing' kind, which means that this controller is not only quiet in the audio domain, but also in the RF. Your AM radio will not buzz as a result of this fan controller. The kit is modification friendly. There are three small prototype areas where the user can install their own components for modifications. Note that in the general sense, this kit allows the control of the power delivered to a load based on a small analog voltage. It is thus possible to control other loads such as lamps and heaters based on light level (using a CDS or phototransistor sensor), temperature (using thermistors, etc), and sound (using a microphone). The four connections in the schematic are connected to the rest of the system as shown in the figure above. Note that this controller requires the presence of the neutral line in the original box. This is equivalent to the requirements of the inductive controller from Leviton. 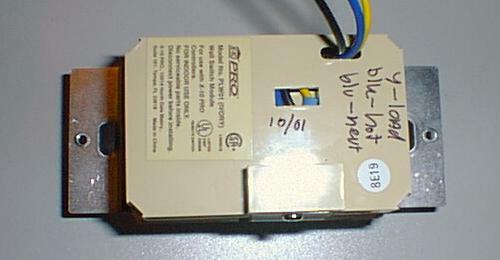 The low power usage of the No Hum Fan Controller on its 'Control' input means that the X-10 wall switch needs to have its own neutral connection. 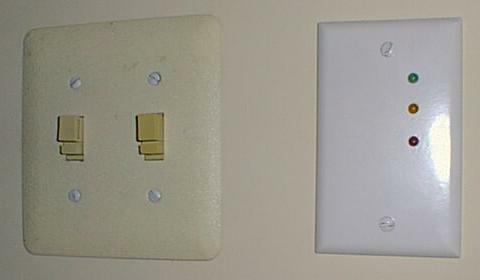 The user has two options in this regard: 1) Use an inductive style wall switch module that comes with a neutral connection (more expensive), or 2) modify a regular wall switch to add a neutral line. The procedure to perform the second option along with the local dimming modification is described next. Open the original switch by pressing the four tabs in the back corner of the unit. The above picture should result. Add the load wire by cutting the longer lead of the inductor, and then attaching a wire to it as show below. Once the wire is added, insulate it with some heat-shrink, such as the blue piece in the picture below. This new wire will be the 'lamp' or load connection. In our project, it will go to the Control line of the Fan Controller. The original Black lead will be the 'Line' connection, and the Blue lead will be the 'Neutral' connection. Next, perform the local dimming modification. This optional step allows dim-bright control of the fan by holding down the single pushbutton on the regular wall switch. In operation, you will see the LEDs on the fan controller continuously and slowly ramp up and down. When the desired speed is reached, you release the button. 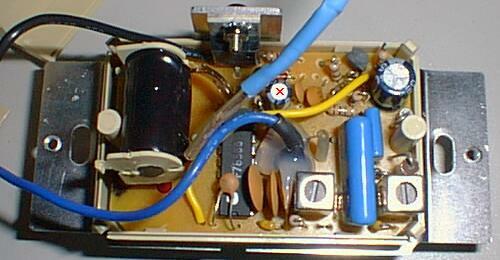 Note the black electrolytic capacitor marked with the red 'X' above. With a pair of needle-nose pliers, pull the capacitor away from the board with a rocking motion. The goal is to short this capacitor out. If the cap rises above the board about 0.2" without breaking loose, you can simply twist the cap one rotation to short it. If it comes off the board with its wires remaining behind, you can short the wires with some solder. Once the above steps have been performed, close the switch back up and use a 'Sharpie' or equivalent permanent marker to document your work. Add a short table for the wire color code, and date your work. My X-10 work bench. Note the Ground Fault Circuit Interrupter outlet for safety. My work bench is shown above. I highly recommend you put together a setup such as this for safe and convenient testing and repair of X-10 units. It contains a wall outlet that is circuit breaker and Ground Fault protected for safety. It also incorporates a small mini-controller to send commands, a lamp (for a load), and a barrier strip in the middle (black). This latter part allows me to quickly hook up wall switches for repair or test. Since it is on a wooden board, I can stash it away to clear my work area until I am ready to repair units again. Visible here is the setup to test the Fan Controller. Once the wall switch is complete, the Fan Controller can be assembled. On side with 'edcheung.com'. Note that the positive terminal (or anode) of a device is pin 1, or the square pad. 'Top' of the board. The shape of the board is designed for proper fit into the wall box. free to modify and add components to customize the functionality of the Fan Controller. On side without 'edcheung.com'. Note that the positive terminal (or anode) of a device is pin 1, or the square pad. 'Bottom' of the board. Only one of the three 10uF caps shown installed. 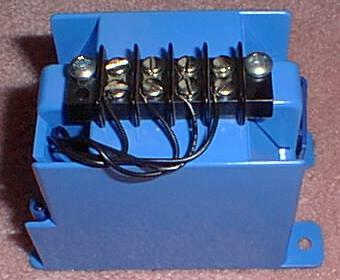 addition of an outlet anywhere using the integral clamps. The top one is shown extended. the potentiometer that allows you to calibrate the unit is easily accessible. As you can see, the capacitors just about fill the box. in the wall, the barrier strip must be covered with electrical tape. 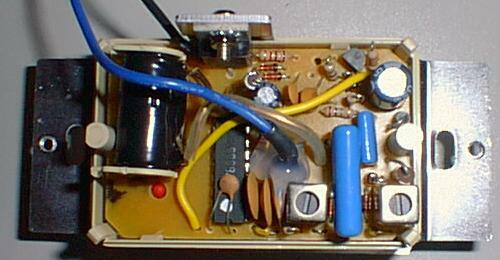 Once the board is assembled, it is mounted inside the enclosure by glueing the tops of the large 10uF capacitors onto the sides of the enclosure using a strip of double sided tape. The front blank cover is then match drilled to show the three LEDs. Alternately, you could use a clear cover to "show off" the electronics. The unit is calibrated by turning the potentiometer at the front of the board until the green LED lights up with a full ON command. Open the breaker to the fan circuit to remove all power. Cut a rectangular hole in the wall just slightly larger than the wall box, and very close to the original switch location. Remove the original switch and locate the line, neutral and fan wires. Run four wires (stranded wire will work for ease of installation) from original box to the open hole you just cut. Attach the four wires to the barrier block in the back of the new fan controller, and cover the barrier strip with electrical tape. Slide the new controller into the wall. Turn the screws of the wall box clock-wise. This will spin the tabs out and pull them towards the sheet rock. Install the modified X-10 wall switch. Turn the breaker back on. Send an ON command to the X-10 wall switch. Turn the pot near the front edge of the new fan controller until the Green LED is fully lit. This calibrates the unit. Test local fan control and speed control from a remote location. How long this will take depends on your skill level. I think the whole process (including the assembly of the kit) should take one weekend. Photo of the finished installation. Note the controlling switch adjacent to the Fan Controller. Complete Parts List in Office '97 Excel format. File with printed circuit board artwork. It can be ordered from www.expresspcb.com (use the Mini-Board service). January 2011 - Chris Elliott sent me an update of the parts list. See here. He also pointed out to me that one capacitor can be eliminated by operating the dot chip in bar mode compared to dot. Thank you Chris. Note: I currently have capacitors available for $10 plus shipping. involves line voltage and associated risks. please consult with your insurance broker.